I bought my wife a pair of Leki hiking poles – or “trekking poles” as there are referred to – a few years ago for Christmas. By the way, Leki is pronounced “Lay key”. … yes, that is a creek running across the trail during winter with ice! Plan on losing the tip cover and clip unless you are religious about storing your poles in the same place every time. I leave the poles in the back pocket of the driver seat in my car and – cross my fingers – still have the hiking poles plastic tip covers and clip. The Leki CorkLite hiking poles weigh in at 1 pound, 1.1 ounces for the set, 17.1 ounces. That is 485 grams for most of the world. A little over half a pound, 8.5 ounces, for each pole. 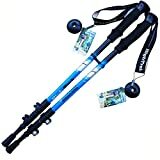 The buyer’s guide has a list of hiking poles that includes weight. 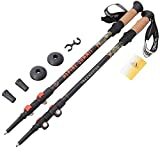 These hiking poles extend to a length of 135cm / 53 inches with a clear message that says “STOP MAX.” Of course, you can extend the poles further, approximately another 10 com / 4 inches total, 5cm /2 inches per stage, till you get to the point that says “SPEEDL”. I did the full extension on one pole and max extension on another pole just for fun. The longer pole has a noticeable amount of flex when you push down on it versus the pole at the recommended max length. Word to the wise, do what they say and stop at the 135cm mark. One tip – if you are going uphill or want to hike faster then you normally would, drop the height by 5cm on both the middle and lower section. At this lower height it is easier to push yourself with the poles. I suspect the reason Leki went with Cor-Tec is that it is more durable then ‘regular’ cork. Again, no disagreement. Assuming price is the same, the carbon fiber poles are likely to be stronger for the weight, more rigid, and – this is debatable – better for vibration, then aluminum poles. Aluminum will likely be heavier. Should you apply too much weight to either a carbon or aluminum hiking pole, the aluminum pole is likely to bend first, then break. When a carbon fiber hiking pole fails, it tends to be catastrophic – snaps and has sharp “snippy” edges. The flick locks, i.e. – Speedlock for Leki, are foolproof. Just flick the lever and the shaft is either unlocked and can slide up or down or it is locked in place and isn’t going anywhere. … the picture of the Leki poles show the straps with two layers – the outer layer is this grainy thick material and the inside material is a thinner softer material stitched into the heavier material. However, there is a weight penalty – they do weigh more and if you are hiking for an extended period of time, weight does matter. Additionally, the amount of spring in the shock might be too much / too little. Word to the wise, do each pole separately – don’t do them at the same like. 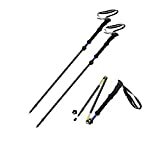 The straps are usually setup for the left and right hand and you want to make sure when you install a new hiking pole strap that you set them up properly. That is what Leki recommends … taking an adjustable wrench and fit it loosely around the shaft of the pole and striking downward until the tip comes off. See for yourself. You will find the baskets are hard plastic with “teeth” to grip whatever you are hiking on. I prefer the smaller, low profile baskets that come with the Leki Corklite poles for all conditions. They basically stay out of the way when swinging the poles front to back and make it easy to pack away and carry. Sure, the bigger baskets are good for snow and such … your pole might not sink down as far with a bigger basket, but for the hiking I am doing in the winter – either on dry trails or snow / ice covered trails, I don’t need the poles to “float”. Go with the clamp lock mechanism and not the twist lock mechanism. There I said it. Both work, or should work, great all the time. The twist locking mechanism usually aren’t as reliable and will fail when you least want them to. Aluminum versus carbon fiber. Most people will be fine with aluminum. Aluminum poles will fail ‘gracefully’ if at all. They will first bend, then break. Carbon fiber poles are stronger and typically more resilient, though when they fail, they break. Most poles can switch from the small, narrow baskets to larger baskets that work in snow. I didn’t say it was easy, just that it can be done. Nor do I think it is worth the effort to swap out baskets on a regular basis, maybe twice a year between the beginning and end of winter if you hike in the snow. 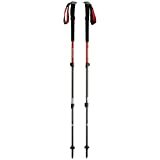 The Black Diamond Woman’s Trail Pro Shock trekking poles are all-around poles designed for women’s use. Made up of three pieces of aluminum shafts, each pole is ultralight and narrow, boasting reduced weight while still delivering optimum strength. This is reinforced by the Dual FlickLock Pro pole locking mechanisms, which also allow for easy length adjustment and clamping force. The poles come with patent-pending Control Shock Technology (CST) for excellent shock absorption. Meanwhile, for improved comfort and ergonomics, the padded adjustable 360 degree Padded Wrist Straps are Left and Right hand specific. Length can be extended from 62 cm to 125 cm (24″-49″), shorter than that of poles designed for men. The narrower diameter and specifically-sized foam grips are other indicators that these poles are women-specific. 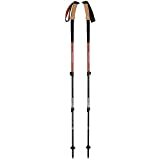 The Black Diamond Woman’s Trail Pro Shock trekking poles are available as a pair of two poles. Tips can be switched from rubber to carbide, depending on the type of terrain. Tip protectors are not automatically included.